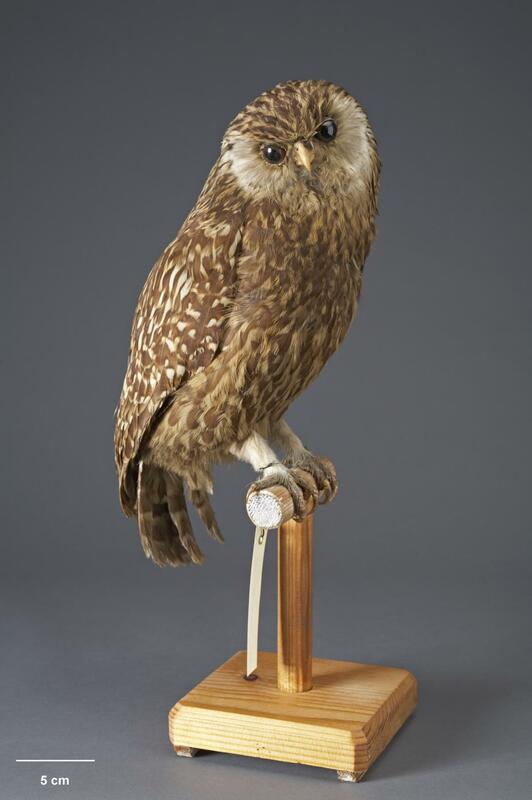 A couple of months ago I received an unlikely phone call from a gentleman asking whether Te Papa was interested in purchasing a laughing owl specimen. He then mentioned in passing that he had an egg also. The museum receives freshly dead or frozen bird specimens most weeks, but it is a rare event to be offered taxidermied bird specimens, let alone of species that are long extinct. 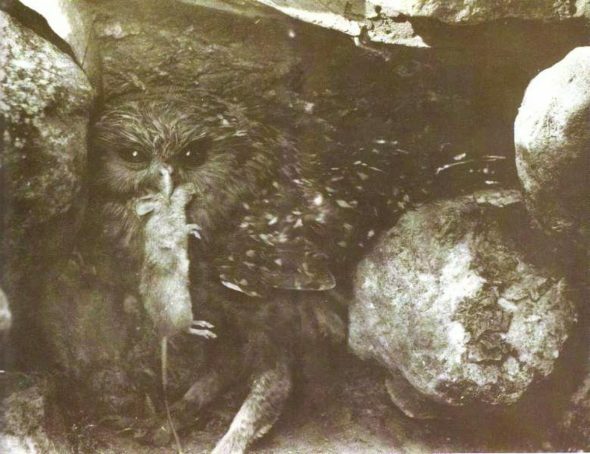 The laughing owl is one of about 16 bird species that became extinct after European contact – i.e. species that may be found as preserved skins and mounted specimens in museum collections, from birds collected before the species expired. In contrast, a further 38 named species that became extinct following Polynesian contact but before European naturalists arrived are known only from their bones (or a few eggs and fragments of skin and feathers in the case of a handful of moa species). Very few preserved specimens of these extinct species ended up in private ownership – with one exception. 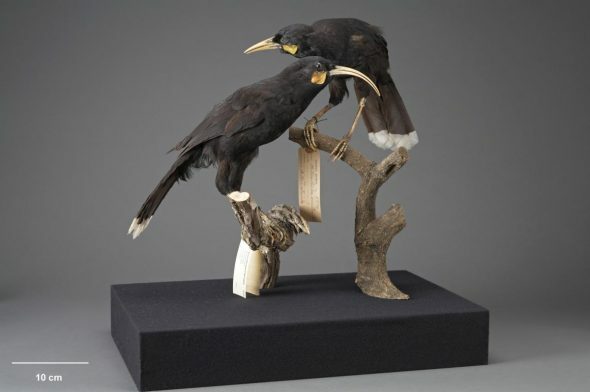 The spectacular-looking huia was both sufficiently numerous and desirable as an objet d’art that many dozens if not hundreds of mounted specimens ended up in private hands – and are occasionally offered for sale. Most of the remaining bird species that became extinct after 1800 were either too rare and localised to be accessible to private collectors, or insufficiently dramatic in appearance to be desirable for display by the general public. For these reasons, there was no modern-day precedent for a laughing owl specimen being offered to the museum. Laughing owls were more than twice the size of a morepork (New Zealand’s other native owl species) and occurred on all three main islands. Their final stronghold was in South Canterbury, where the last known specimen was collected in 1914. They were fully protected continuously from 1910, and therefore any specimens are likely to be more than 100 years old. Laughing owls survived just long enough for a few black-and-white images to be taken, revealing a glimpse of what the birds looked like in life. 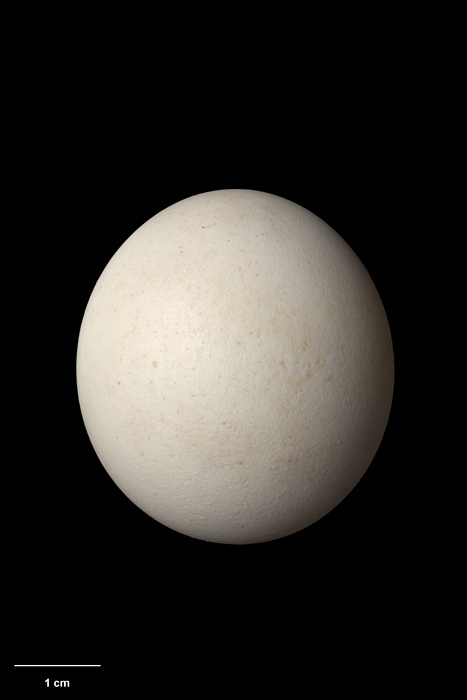 Unfortunately the bird and egg offered to Te Papa have no associated information about what part of the country they came from, and when they were collected. All we know is that they were owned by the same family for at least four generations. They are in remarkably good condition, suggesting that the mounted bird at least was kept away from insects and bright light. Known specimens of laughing owls were listed by researcher Trevor Worthy in 1997, with four additions and a deletion from the list provided by Alan Tennyson and Paul Martinson in their 2007 book Extinct birds of New Zealand. 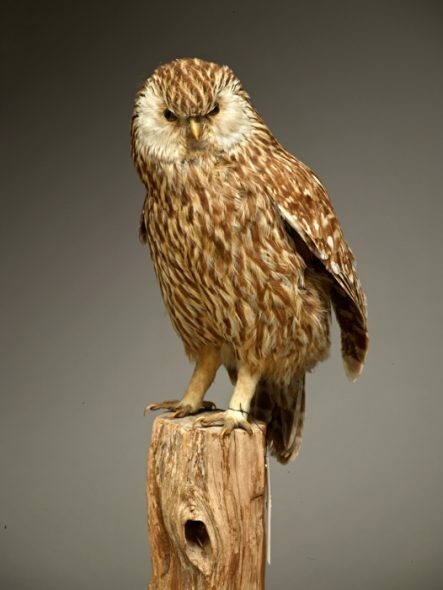 None of these authors were aware of the specimens recently acquired by Te Papa, and so this mounted bird and egg bring the total known holdings of laughing owl specimens worldwide to 26 mounted birds, 28 study skins and 20 eggs. Before this acquisition, Te Papa held one mounted laughing owl, one study skin and one clutch of 2 eggs. Although we have little information about the provenance of these two new specimens, the fact that they are now held by a public museum provides the opportunity for researchers to make forensic comparisons with other specimens to learn more about where and when the bird might have lived, and who the skilled taxidermist was who prepared it in such a life-like posture. Maybe there’s more specimens (of whatever flora, fauna …) out there in family collections waiting to be handed in 🙂 Hopefully more accurately tagged! What an interesting article but I would like to know why it was named “laughing owl”, Was it for its voice? The picture is so nostalgic. Yes, the name is generally attributed to the bird’s call. However Thomas Potts writing in 1870 (Transactions of the New Zealand Institute 3: 63) described its call as “a series of dismal shrieks frequently repeated…Why it should [be called] the trivial name of “laughing jackass” we know not; if its cry resembles laughter at all, it is the uncontrollable outburst, the convulsive shout of insanity; we have never been able to trace the faintest approach to mirthful sound in the unearthly yells of this once mysterious night bird”. Perhaps I should have titled the blog ‘No laughing matter’!